The 1972 Italian Grand Prix was a Formula One motor race held at Monza on 10 September 1972. It was race 10 of 12 in both the 1972 World Championship of Drivers and the 1972 International Cup for Formula One Manufacturers. 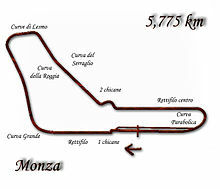 Before the race, the Monza circuit was modified with the addition of two chicanes, one before the Curva Grande and one at the site of the old Curva Vialone, in order to reduce speeds in the interests of safety. The 55-lap race was won by Brazilian driver Emerson Fittipaldi, driving a Lotus-Ford, after he started from sixth position. With the win, Fittipaldi sealed the Drivers' Championship, becoming the youngest ever champion at 25 years and 273 days until superseded by Fernando Alonso at 24 years and 59 days in 2005; Lotus also secured the Manufacturers' Cup. Englishman Mike Hailwood finished second in a Surtees-Ford, with New Zealander Denny Hulme third in a McLaren-Ford. The race marked the last win for American tyre manufacturer Firestone in Formula One. It was also the last race in which 1964 World Champion John Surtees competed. Team Lotus was forced to run only one car because Emerson Fittipaldi's Lotus 72D was seriously damaged in an accident while being transported to Monza. Fittipaldi raced another 72D, but with specifications very close to the 1970 model. ^ "Motor Racing Programme Covers: 1972". The Programme Covers Project. Retrieved 13 November 2017. 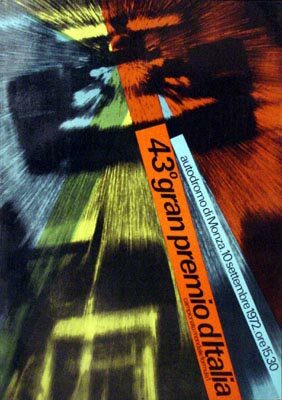 ^ "1972 Italian Grand Prix". formula1.com. Archived from the original on 7 November 2014. Retrieved 22 December 2015. ^ a b "Italy 1972 - Championship • STATS F1". www.statsf1.com. Retrieved 18 March 2019.